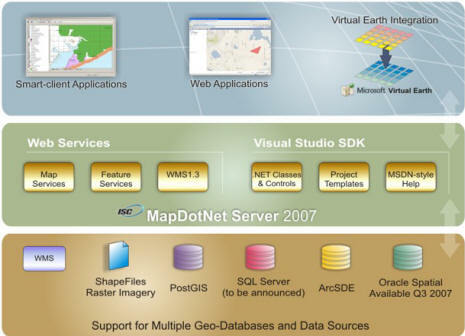 The Live Maps / Virtual Earth Blog points out that the MapDotNet Server 2007 is available for download. The basic principal is very straight forward - server based GIS with access to enterprise data, dynamically rendered for use in Web applications. You have data in Oracle Spatial, PostGIS, or ESRI shape files that you want to integrate in ASP .NET apps. MapDotNet supplies drag n drop server controls for Visual Studio to hook up to your data sources and render map layers on the fly. Advanced features include direct editing of data in ESRI ArcSDE and projection transformations. So there you go, if you are unhappy about the cost of ArcGIS Server and run ArcSDE, this might be something to take a look at.